Dorothy Day holding up a prison dress. Photo courtesy of Jim Forest through a Creative Commons license. The Armchair Theologians series from Westminster John Knox is, as one expects by the title, designed to be an accessible and entertaining approach to the biographies of some of the most significant theologians. The authors for these volumes are always fans of the biographical subject. Therefore, there tends to be a bias toward the views of the subject, with a very minimal critique offered. Elizabeth Hinson-Hasty’s recent contribution to the series on the socialist Catholic, Dorothy Day fits into the series well. On the whole, Hinson-Hasty celebrates the life and work of Day, only stopping to critique Day in those places where she was not sufficiently feminist. Therefore, Day’s negative view of abortion, willingness to get married, and traditional views on sexual orientation are noted as blemishes on her record and excused based on chronologically inferior cultural influence. Setting aside the somewhat hagiographic aspects of this work, and the series in general, which are native to this approach, this volume in particular is a very helpful means of getting introduced to the lives of significant theologians. In fact, the whole series by Westminster John Knox is enjoyable because the authors like the subject. This makes the prose more lively in many cases. At just about 200 pages, Hinson-Hasty provides an overview of Day’s life and work that covers the major epochs in her life, the main thrust of her work, and helps to place Day in her cultural context. Additionally, the author shows how Day’s ideas have been appropriated and applied to contemporary social justice movements. This makes the book a useful introduction into the topic. Before reading Hinson-Hasty’s book, Dorothy Day was relatively unknown to me. In fact, this is one of the reasons I requested this book for review. I have read excerpts of her writing in my time as a seminary student, but had learned very little about her. 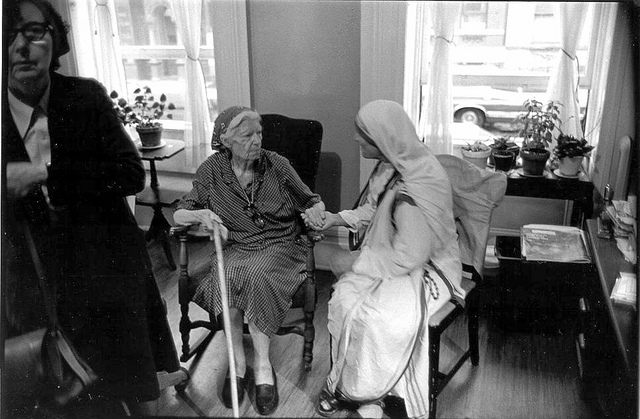 Dorothy's last meeting with Mother Teresa. This occurred in Dorothy's room at Maryhouse in Manhattan. Eileen Egan is on the left. The photo was taken in 1979, the year before Dorothy's death, by Bill Barrett. (Marquette University Archives) Photo Credit to Jim Forest through a Creative Commons license. Dorothy Day was not a professional theologian or ethicist. In fact, she had no academic credentials to speak of. She was, however, a writer and a social activist who was key in the labor movement in a particular era of American history. Day’s life demonstrates that all the degrees in the world do not make one influential, and that influence can be gained by continual, faithful witness. Day was nothing if not a legitimate practitioner of her views. She was a socialist, and so she lived in community. She was a strong advocate of a “peace ethic” and so she went to a great distance not to have hierarchical relationships, or even rules, in the open communities in which she lived. Dorothy Day was influential for some of the liberation theologians. Her writing in the Catholic Worker, as pro-socialist newspaper, helped to shape the thinking of many of the Latin American liberation theologians such as Gustavo Gutierrez. Much like Gutierrez would later do, Day lived in poverty in the slums rather than doing her philanthropic theologizing from a distant suburban neighborhood. It is for her integrity that Day deserves the most praise. 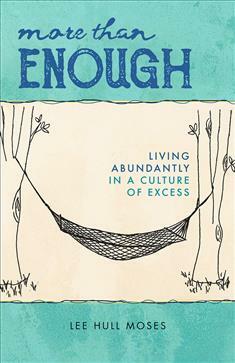 She authentically lived in community with people from any and every social background. She sought to do her work for the poor from among the poor. This helped keep her faithful to her message, and lends credibility to her writing. Hinson-Hasty helped me gain a new appreciation for Dorothy Day through her presentation of Day’s life in this biography. In the end, while I do not agree with the author’s theological positions, this is a helpful book. In fact, all of the Armchair Theologians are worthwhile reads when you are trying to get a quick overview of the life of a significant Christian thinker. I commend this book and the entire series to readers because, in a world awash with information, such brief biographies provide engaging and informative introductions. While not suitable for academic research, they are beneficial for personal edification. Note: A gratis copy of this book was provided to me by the publisher with no expectation of a positive review. All opinions expressed are my own.